Western Express, the runner-up in the Grade 1 Champions Mile held in April at Sha Tin and the lone challenger from Hong Kong for this year’s Grade 1 Yasuda Kinen, arrived safely at Narita International Airport in Chiba Prefecture early Tuesday morning. 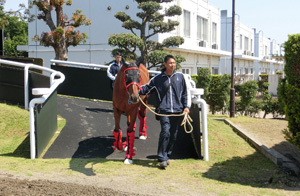 The 6-year-old gelding was then transported to the quarantine facilities at the JRA Horseracing School Quarantine Center, where he arrived at 9:27 a.m., completing about a 10-hour journey from their home base at Sha Tin. Western Express, with seven wins from 21 career starts, is searching for his first Grade 1 glory, after finishing second in the Champions Mile and the Hong Kong Mile last December. Trainer John Size is no stranger to JRA racing, having raced Contentment in the Yasuda Kinen for two consecutive years, but has yet to send a winner to Japan. The Yasuda Kinen will be run on Sunday, June 3 at Tokyo Racecourse, with a scheduled post time of 15:40 local time.